After the hour plot consultation, I wander outside. My thoughts soften. The writer I just worked with and the protagonist of her novel meld into one. They’re each in pursuit of an outer goal — the writer to finish her novel, the protagonist to find her father. The actualization of their external, measureable goals has the potential to transform their outer lives. If the writer continues writing forward, she finishes what she started ten years ago. So long as the protagonist doesn’t give up, she gains the answer to what haunts her. To successfully complete just about any outer goal, first an inner goal must be achieved. The deeper purpose of just about every outer goal is to reveal and transform our flawed thinking and limited beliefs. To complete her external goal, the writer must develop self-confidence and an inner belief in herself. The protagonist must overcome her major flaw of bull-headed impatience. The writer plots the steps for her protagonist to find her father on a Plot Planner. 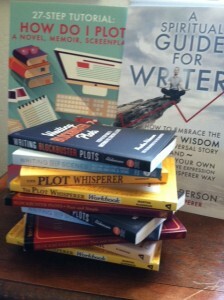 A Plot Planner follows the path of the Universal Story and maps out the highs and lows along her journey to success. At the same time, the writer plots out how many words she plans to write everyday to reach her deadline. Immediately, the structure creates inner tension in the writer. As the writer’s energy plummets, she rattles off all the reasons why this time will be no different than every other time she’s started and stopped. Except… I remind her, this time, as she tracks her daily word count, she’s also going to track her energy. Using an element from The Plot Whisperer Book of Writing Prompts, I ask her to take a minute after every writing session to assess her energy level. We take our temperature to assess our physical well-being. Our emotional energy level reflects our spiritual wellness. You’ve pre-plotted every scene idea on a Plot Planner and plotted all your characters’ actions and the antagonists she meets. Now try it for yourself. First decide on a concrete, measurable goal for yourself. Pick a goal that is within your ability to reach. It’s best if it’s something you’re passionate about achieving. Next assess what personal flaw or trait of yours is most apt to interfere with reaching your goal. Some abilities and skills are external and necessary to complete your external goal. For instance, a writer is well served knowing how to put sentences together, use dialog, manipulate plot, and all the other elements of writing fiction. Other necessary skills and abilities are internal. Each of the internal lessons and wisdom critical to achieving her goal point to emotional maturity and spiritual actualization. Give yourself a deadline. A 21-day challenge is a good place to start. Next decide on the daily actions you plan to take to reach your external goal in 21 days. 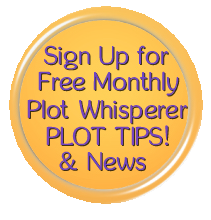 Plot those actions on a Plot Planner. Everyday track your progress. At the same time, also track your energetic emotional state as it relates to your inner goal. Watch for the emotions and limited beliefs that trip you up in the beginning. Don’t be surprised if they crush you toward the end of the middle of your challenge. By the end, you find yourself demonstrating emotional maturity in your ability to understand and manage those same emotions and beliefs. You want immediate success and struggle with delayed gratification. Then your major flaw may be the inability to keep long-term commitments. Or you’re wishy-washy. You’ll see your weakness every time you schedule writing time and go out to lunch with a friend instead. Or you say you’re going to paint, and then you don’t. Do you blame others for your failure to accomplish what you set out for yourself? In the middle of the 21-day challenge, you’ll struggle. By the end of the challenge you find you’re taking responsibility for your actions. Over time you learn to accept your current life circumstances as a result of your own personal decisions. You think you know it all? Your outer goal requires you to seek counsel and ask for help. Your inner goal is opening your mind to others’ opinions and views. Are you hypercritical of yourself? Everyday track when and how you tear yourself down. The further you move through the Universal Story you begin to accept yourself. You appreciate that your strengths and your weaknesses are necessary in your personal evolution. As you become less judgmental of yourself, you find you’re less judgmental of others, too. Believe you’re entitled to more than what you have? You likely become frustrated when you can’t have what you want. Your inner goal then becomes learning gratitude and to appreciate what you do have. Character emotional development toward transformation and emotional maturity evolves over time from all that happens to the character in a story. Our own personal transformation evolves over time as a sum total of all our actions. To achieve outer success and inner joy you must first know yourself. To know yourself is to know your mind, your body, and your spirit. Especially your spirit because it reflects your passion for life. Track your emotions and your energy. Come to recognize what external circumstances and your internal spirit are trying to teach you about your life. 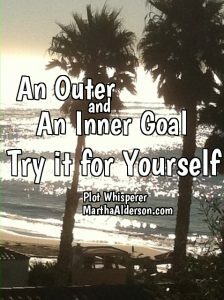 The outer and inner goals you establish provide a gateway to your inner world. You give yourself a goal and immediately confront yourself – your abilities, strengths, beliefs, resistance and struggle. You come face-to-face with your dreams and fears, your patterns and flaws, your supporters and foes. Your inner spiritual purpose and potential are intrinsically linked to the outer path to your creativity. The trick to having what you want is to view the challenges in your life through the Universal Story. Together, outer success and inner joy add up to a transcendent life.